As regular readers – although I will admit that the readers are almost certainly much more regular than the writer- are probably aware we moved house a couple of months ago and are currently installed in a small damp cottage while solicitors hesitate and faff over the conveyancing of our new house. It has not been an experience that I would recommend to any of you. However, there is light at the end of the tunnel in that we do at least have a probable destination and the prospect of a project. It has given us something to look forward to – I was going to post a picture of said house and potential garden but fear that that would be a little foolish before the deal was finally finalised. Finally. So that is a pleasure that will have to wait a little bit. Sorry. You’ll like it when the moment actually comes, I promise. It is a very nice house with a rather different garden to Blackpitts. Since I last wrote this blog other things done include, apart from the hell of actually packing up twenty years of live and moving….. Writing sundry stuff for the nice people who ask. Visiting various gardens (including a particularly fabulous one in Wiltshire – see above). Sat on assorted RHS committees. Some fascinating and some not quite as gripping..
Filmed a four part television series for the BBC – which we expect to transmit in about January. It also features Joe Swift and Ann-Marie Powell. I think it may well be quite good. Gone to Bordeaux – very lovely. Gone to Cornwall – ditto. Been to see Kate Bush – who was organised by my very clever sister. Gave a lecture among the dahlias at Kelmarsh Hall. I have introduced young Mr Titchmarsh to an audience brimming with middle-aged zeal at the Cheltenham Literature Festival. Eaten half a turbot at Sheekys. Ordered a handsome tweed jacket. 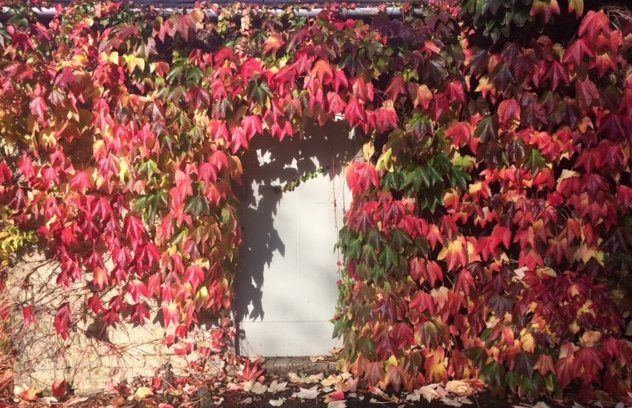 I have been enjoying the Boston Ivy (Parthenocissus tricuspidata). For twenty years I thought it was Virginia Creeper (Parthenocissus quinquefolia) but this year I looked closer and realised my mistake. Right now this minute I am sitting on RyanAir flight 667 to Dublin. I have written before about RyanAir and their general ghastly dreadfulness and nothing has got better in the intervening years. In the Seventies I used to travel up and down the country – mostly to parties at various country houses, to some of which I even had an invitation (iii) – by National Coaches. I am sure that nowadays they have all mod cons: lavatories, wi-fi, hostess trollies and antimacassars. In those days they had nothing except seats and the only comfort was an ashtray in the smoking section (the rear seats on, I presume, the assumption that if one was moving forwards then the exhaled smoke would be blown backwards). The journey was interrupted at various service stations for toilet stops and cups of tea. Quite often, if travelling after a rough night, I would fall asleep on my neighbour’s shoulder and, on one particular occasion, dribble on their jackets. My point is that RyanAir is very like an airborne version of those 1970’s coach services. Part of my distaste for RyanAir is that, almost from the moment of takeoff I find myself bracing for the almost inevitable self congratulatory fanfare and that annoying voice trilling about how many flights are on time. It is almost worth wishing for a delay. I digress, I am in Dublin to give a talk to almost all of the horticultural students currently at college in Ireland. When I say “a talk” I actually mean “two talks” as they cannot all fit into one lecture theatre so I have given the lecture twice, back to back. Needless to say everybody was delightful and I also fitted in an early morning walk along the pier at Dun Laoghaire and a handsome bit of hake. On the flight back my foolish wish not to hear the RyanAir “We love ourselves because this flight is on time fanfare” came true as the plane was an hour late. Be careful what you wish for, people. 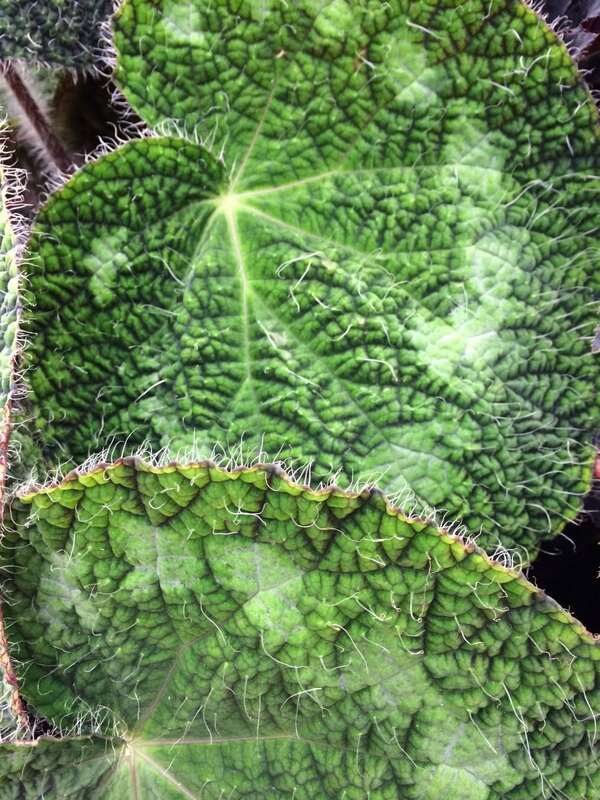 The picture at the top is of a hairy begonia leaf. I am listening to Burnt out Town by Tom Petty. (i) Allow me, for the benefit of those of you who are not yet aware, to explain the Twig. It is a little snibble: an article exactly one hundred words long written on any subject at all for the intoGardens website. They are fun to write, easy to read and anybody who wants to have a go should send me a Twig. (iii) There was a time when I was very good at gatecrashing parties: even parties at the other end of the country. Such dedication to the wholehearted pursuit of whatsoever happened to available for pursuit was exhausting. Yerwott!!??? Your sister manages Kate Bush?? Now he tells me…. How interesting that you should talk about your experience on Ryan Air! Recently on a lecture trip to the The States, yes or should I say ‘stadium tour’ – I was just settling into my comfy, British Airways seat (none of that cheap bucket stuff for me my dear) peanuts finished, G&T ordered and I was fumbling with the audio options on my seat arm. Oh the RHS have a programme, that should be interesting (it proved quite the opposite) as some wet behind the ears, upstart of a so-called designer was wittering on about something to do with plants… I cannot for the life of me remember what he was saying, and also his name..?? Jamie Alabaster-Eclair I think? Why the RHS let him speak on their programme was beyond me? So I switched channels and listened to Clare Balding waking through Arundel pursued by a couple of whippets. So when you are next paying £.43 pence for your cheap ticket to Dublin, think yourself lucky that you don’t have to be submitted to such an ordeal! Happy flying! You must have been erroneously upgraded – that podcast is only available to the smartest of people. Did you also visit Ms Powers whilst you were in Dun Laoghaire? You could have had a jolly time looking at your favourite pictures of carpets. Next time you’re in Wiltshire do pop in, I’m perfecting a pear, chocolate and almond cake recipe in readiness for your visit. Sadly I did not – I was only there for about 24 hours. Our carpet burns will have to remain virtual. Looking forward to a glimpse of your new garden (fingers crossed) and the tv series. I blame my transition from merely ‘doing the garden’ to becoming a gardener on Cleve, Joe & AMP mucking about on some long forgotten satellite channel. Well partly at least. Nearly there. I have a garden but am not yet sure either what is in there or what I am going to do with it once I do know. Amazing photos! I didn’t understand what is this plant on that wall? It looks so amazing! Thanks for sharing!